1. Mix the paprika, cayenne, oregano, garlic and prawns together. Season and leave to marinate for 10 minutes. 2. Meanwhile, preheat a non-stick griddle pan or the grill to high. Cut one lime into quarters. Thread the prawns onto 4 skewers. Spray the prawns and the lime quarters with oil and cook for 4-5 minutes, turning often, until the prawns are pink and opaque and the lime is charred. 3. Mix the yogurt with half the coriander. Season and set aside. 4. Cook the rice according to the pack instructions. Mix with the salad onions, spinach, remaining coriander and finely grated zest and juice of the remaining lime. Season. 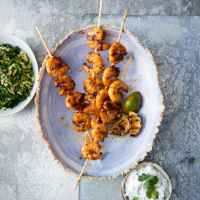 Serve the skewers with the rice, yogurt and grilled lime wedges to squeeze over.